Margaret River - Located only an 800m stroll to town. Close to beaches, wineries and cafes. 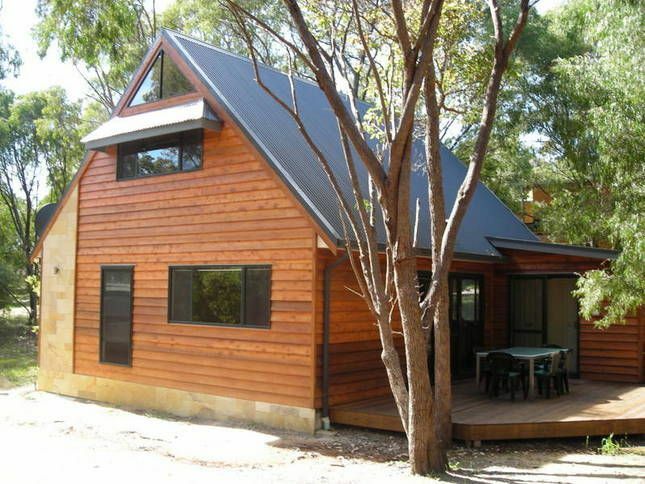 Luxurious holiday chalet located in natural bushland complete with modern fitout. This holiday has 4 spacious bedrooms, 1 x bath/spa, 2 x WC. It is a great set up for families with 2 x queen beds and 5 x single beds. 2 additional fold out sofa beds if required. A portacot and high chair is available on request. Really enjoyed our weekend. Plenty of room for a group of 8. Everything you need and a short walk to town. Highly recommend! My friends and I stayed at the house for 4 days over the Australia Day long weekend. The house was in a great central location, just a 2 minute drive to the city centre. When we arrived at the house it was tidy however it had a damp, musky smell like it hadn't been cleaned in a while. The couch and blankets smelled very musky and dirty. Unfortunately the facilities that were advertised to us were not in working condition. We were unable to get the air conditioner unit, oven or dishwasher to work during the duration of our stay. Once our trip was over and we arrived home I contacted the home owner to let her know about our stay and was hoping to hear back with answers to our queries. Unfortunately I did not receive any response from her and proceeded to message her two more times and did not get any response back over the past few weeks. Overall the house was ok and was in a good location, but the lack of working facilities and musky smell throughout the house was off putting. Most of all I am really disappointed with the lack of communication from the home owner. Accommodation was in a good location, about a 10 min walk into town. Nice trees surrounding. Pretty comfy and lots of space for 7 adults.